We want to celebrate the fifth birthday of the Intercultural Tutors Team (ITT) and the successful completion of the project “Diverse living – from them to US” with a photo competition. Prizes of a total of 1,500 euros await the winners. What is the meaning of diversity for you? What experiences and challenges regarding diversity do you want to share with us? How you deal with the topic is – of course – up to you. It can be positive or you can have a critical approach to the subject. 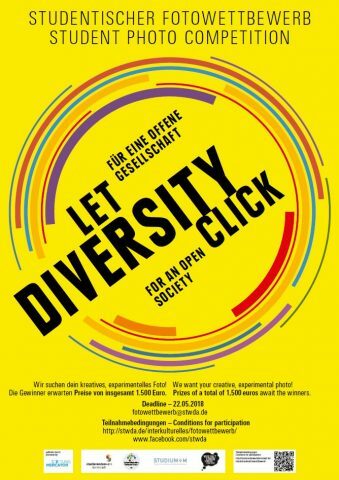 Every student, who is enrolled in a university in Darmstadt, can participate. How many pictures can be handed in? Participants can only hand in one picture. What criteria – regarding the picture – have to be followed? How to name the file? Where do I send the picture and what kind of information has to be included? Name and e-mail-address must be included. Further-more, pictures without a full description cannot be accepted. What has to be part of your application? How are the photos assessed? If a sufficient amount of photos is handed in, a panel will rate the pictures. Prizes will be awarded to the photos with the best scores that are regarded as worthy of getting an award. No recourse to legal action is possible. Place and time of the award ceremony will be announced in good time.